Please follow MY CHARTS so I’m not relegated to the dung heap of nobody is interested in this crap. You only have to follow once. You click the blue icon seen in the upper right of each page that says “Follow”. After you’ve clicked once, the blue icon should change to “Unfollow”. Leave it so it says “Unfollow”. There will be a test later on the material in this edition of the blog and everyone not achieving 100% will be kicked out of the blog. True . . . would I lie??? If I’ve screwed up something, just send me an email through the comment section and I’ll fix it. But I don’t make mistakes, only senile old farts make mistakes . . . oh wait, that’s what I am . . . never mind. Just send an email and since I’m now 105, I’ll try to fix it (literary license). MY CHARTS – can be a mystery to some, so I decided I would explain what I’m trying to show in each chart. I will keep MY descriptions short and concise. But I’ll also use the more loquacious StockCharts definition of the indicator when available. I will depend upon feedback questions from you if I need to create a better definition of a SPECIFIC CHART. Feedback can be found on my charts in the upper right corner of each chart page where it says in blue “send feedback”. The location of the chart is indicated by page number and chart number and they are in sequential order. Chart numbers are in numerical order beginning with a zero instead of one. The charts on each page range from 0 to 9 (10 charts per page). There are 10 pages, which begin on page 1 and not page 0 (huh . . . kinda inconsistent). I do on occasion move charts into different locations and this might cause you to look around to find its new location. If you familiarize yourself with Paul Desmond’s paper, “The Warning Signs Of Major Market Tops”, you’ll find that I do try to illustrate his theme. I also have charts that are not part of Desmond’s warning regarding Market Tops. These charts are hopefully trying to show a relationship to future market direction, but sometimes the connection can be tenuous. I’m always looking for a cause and effect in the charts. The indicator is the cause and I’m looking to see if it has an effect on the market. I will chart the indicators back to major market turns to see if there was an early indication of the impending turn in the market. Some indexes (or stocks) have historically shown a tendency to turn before the major indexes like SP 500 or Dow Jones Industrials. 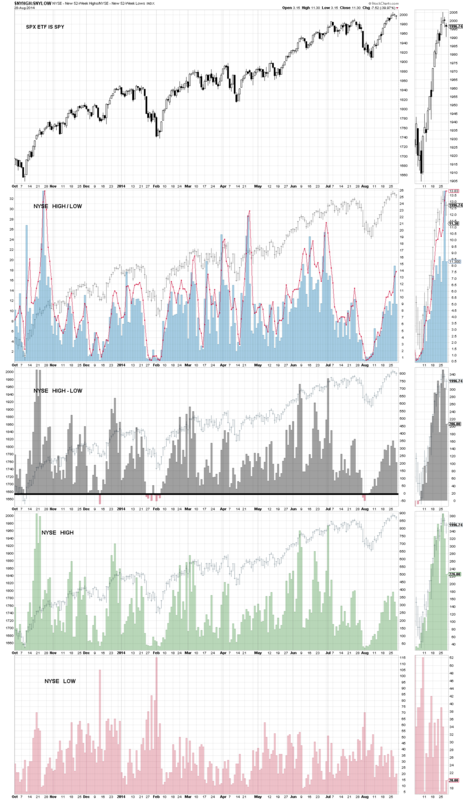 Due to space limitations of ten pages, I can’t show historical charts for all the indicators. In all of my charts, I’m always looking for the bullish or bearish divergence. This is probably the most important concept to watch for in charts and indicators. As for all of my charts, I’m always looking for a bullish or bearish divergence. “Moving averages smooth the price data to form a trend following indicator. They do not predict price direction, but rather define the current direction with a lag. Moving averages lag because they are based on past prices. Despite this lag, moving averages help smooth price action and filter out the noise. The two most popular types of moving averages are the Simple Moving Average (SMA) and the Exponential Moving Average (EMA). These moving averages can be used to identify the direction of the trend or define potential support and resistance levels. A simple moving average is formed by computing the average price of a security over a specific number of time periods. Most moving averages are based on closing prices. A 5-day simple moving average is the five day sum of closing prices divided by five. As its name implies, a moving average is an average that moves. Old data is dropped as new data comes available. Exponential moving averages reduce the lag by applying more weight to recent prices. The weighting applied to the most recent price depends on the number of periods in the moving average. When you see indexes moving to new highs and the percentage of stocks above their 200 day average is declining (bearish divergence), this shows that fewer stocks are participating in making new highs. This is bearish behavior. The opposite of this concept is also true, index rally highs with a rising percentage of stocks over their 200 day moving average shows expanding participation. This is bullish behavior. Gotta remember that smaller capitalization indexes are more sensitive to future market moves. Why? Since these stocks are more thinly traded (poor liquidity) than larger capitalization stocks, investors move in or out of these stocks earlier than the large capitalization stocks. 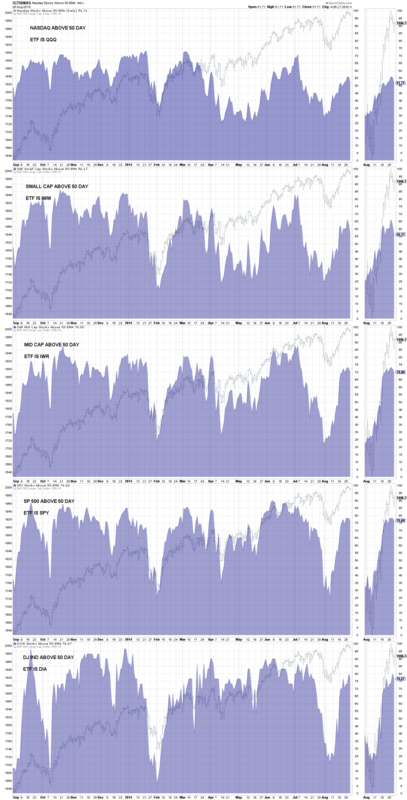 Consequently, the large capitalization indexes will often be the last participants in a bull market, while other indexes have been trending downward for awhile. Therefore, the micro-capitalization indexes will have turned down long ago, while the large cap indexes kept forging ahead. How can an index move to new highs if fewer stocks are participating in the move? This is possible because most of the index averages are weighted towards capitalization. A stock that has 1 million shares in capitalization moving up 1 point has a smaller influence than a stock that has 10 million shares capitalization that moves up 1 point. I’m always looking for a bullish or bearish divergence. This is the exact same chart as PAGE 1 CHART 2 except we are looking at 50 moving averages. Everything stated above regarding the 200 day average is true for the 50 day moving average chart. The shorter time span (50 days) makes this chart more responsive to market direction and also more prone to whiplash. StockCharts provides no information regarding this indicator and it’s a muddy one to leave out the explanation. This indicator is showing a stock’s current price compared to its price scale of its 52 week high to its 52 week low. The result must be expressed in a percentage of where the current price is located on the span of points from its 52 week high to its low. If the price was currently at the 52 week high, this would result in an answer of 100%, at the 52 week low results in an answer of 0%, and right in the middle of the high low price span would result in 50%. This is probably clear as mud and I’m not good in mud. But here is an illustration of how one component would be computed in an index of stocks. 500 stocks in the index would mean this would be calculated 500 times and then create an average for all 500 components. This is not something you ever need to do (computers do our thinking for us), but hopefully an example will show you what the chart is telling you. How much does one point represent in percentage terms? 100 / 55 = 1.8% and this is the amount one point represents in percentage terms, call the result “percentage point”. As an index is moving higher and more stocks are not making new 52 week highs, this indicates weakness and a bearish divergence. This has great similarity in concept to what was illustrated in PAGE 1 CHART 0 – – PERCENTAGE ABOVE 200 DAY MOVING AVERAGE. Any chart that has a similar concept to “PAGE 1 CHART 0 – – PERCENTAGE ABOVE 200 DAY MOVING AVERAGE” can use the same deductions found in PAGE 1 CHART 0. The reverse concept is obviously true (bullish divergence). This chart is showing the daily movements of new highs and new lows on the New York Stock Exchange. 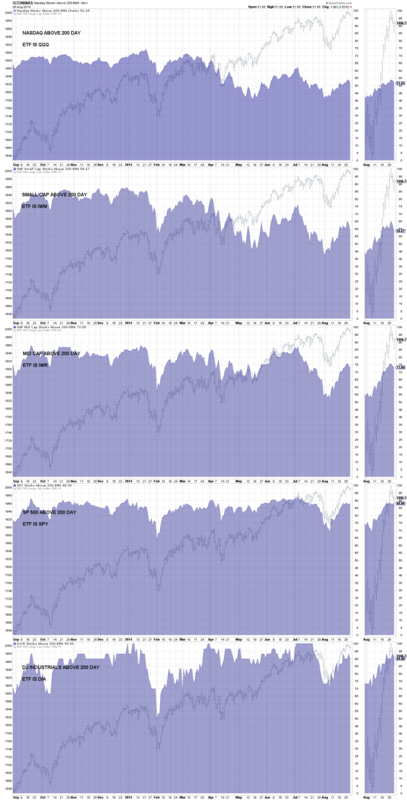 Chart #2 is the ratio of (daily new highs divided by new lows). 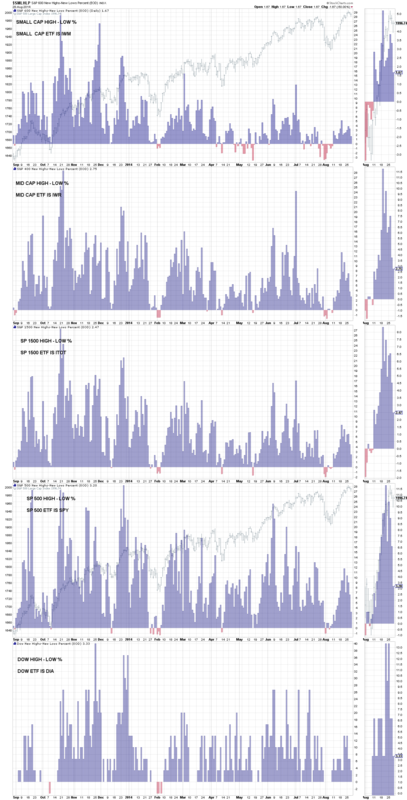 A rising ratio indicates a rising plurality of new highs (bullish). The daily ratio is shown by the blue histogram and the red line is a moving average of the blue histogram. In the background is the SP 500. As always I’m watching for a trend that is divergent from prices. Chart #3 is new highs minus the new lows. This is shown in the gray histogram (or red histogram when negative) and in the background is the SP 500. This indicator can on occasion be more useful for trend than the ratio. Chart #4 is the number of daily new highs in green with the SP 500. This is an exact copy of chart 5 only it’s showing the NASDAQ exchange. 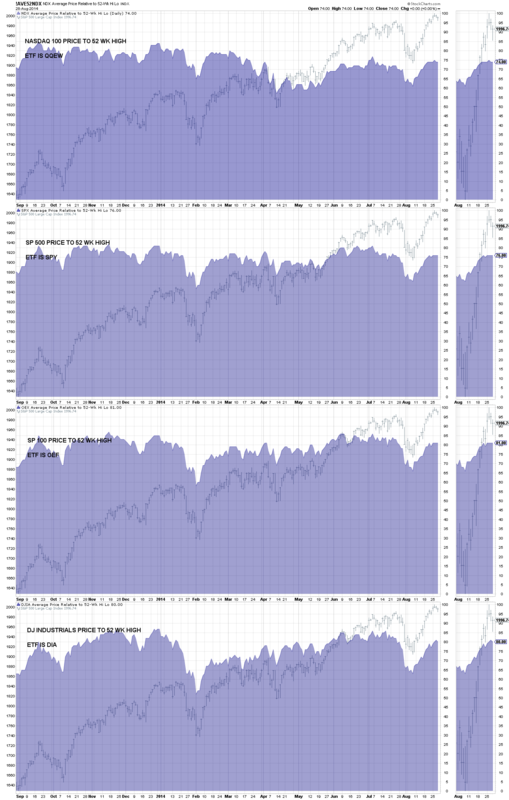 This is the daily new highs for various indexes and is illustrated by a gray histogram, SP 500 is in the background. No lows are used in the calculation of these charts. 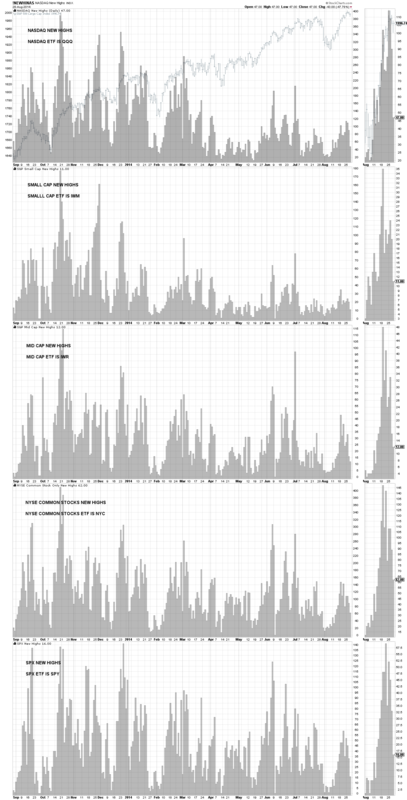 This is the daily NET new highs for various indexes and is illustrated by a gray histogram, SP 500 is in the background. “If you’ve somehow managed to not learn about Mark D. Cook by now: he is a ‘Trading Wizard’ featured in Schwager’s series of books, a legendary futures trader and the winner of the 1992 U.S. Investment Championship (with a 563.8% return). His most famous contribution to trading and technical analysis is his self named, Cook Cumulative Tick Indicator. This indicator is, as the name suggests, simply a cumulative count of tick throughout the trading day. The exact recipe is only known to Mark D. Cook but from what he has publicly divulged, we can try and estimate the Cumulative Tick Indicator to a pretty good degree. First, separate the noise from the signal by ignoring any tick readings within the +/-400 range. We then record and aggregate those readings outside this range at a fixed time interval. We don’t know exactly what interval Mark uses so just pick a time interval: minute, hour, day, etc. The important thing is to be consistent. That’s it! Now you have the super secret Mark D. Cook, Cook Cumulative Tick Indicator. So what do you do with it? Watch the 95th and 5th percentile. If the Cumulative Tick Indicator is above the 95th percentile, sell; if below 5th percentile, buy. Remember, this is a counter trend strategy so the more extreme the tick, the more vicious the snapback. As with all counter trend strategies, mind your protective stop loss! I disagree with one point on what is stated below. When an uptrend begins after a long and significant decline, you will get a reading over +400 and that is not a sell point. It’s an initial overbought point that occurs early in the takeoff on a bull move. I seems that you are more likely to get a tick reading outside of the +/-400 range on the NASDAQ than the NYSE. ‘First, separate the noise from the signal by ignoring any tick readings within the +/-400 range. We then record and aggregate those readings outside this range at a fixed time interval. We don’t know exactly what interval Mark uses so just pick a time interval: minute, hour, day, etc. The important thing is to be consistent. That’s it! Now you have the super secret Mark D. Cook, Cook Cumulative Tick Indicator. So what do you do with it? Watch the 95th and 5th percentile. If the Cumulative Tick Indicator is above the 95th percentile, sell; if below 5th percentile, buy. 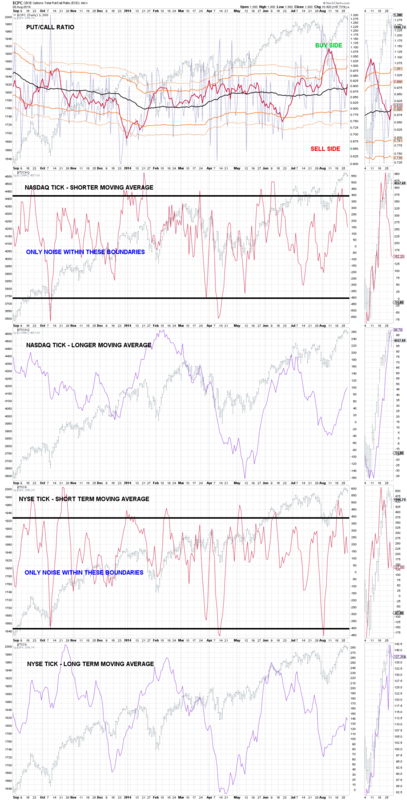 Chart 1 is the put / call ratio surrounded by trading bands illustrating when the indicator is outside of normal expected behavior. This indicator has a very good record of forecasting major peaks in advance as indicated by the historical chart below. As always you are looking for divergent action from prices. The current chart for cumulative advance decline follows. “The advance-decline volume statistics favor large cap stocks over small-cap and mid-cap stocks. The Nasdaq trades some 2700 stocks every day – give or take a couple hundred. The NYSE trades over 3000 stocks per day. The vast majority of these stocks are small and mid size companies. Even though relatively few are large-caps, the largest companies account for the most volume. Large-caps such as Microsoft, Intel, Cisco, Comcast, Dell, Oracle, News Corp, Apple, Research in Motion, Ebay, Applied Materials, Adobe and Qualcom regularly appear on the most active list. Small stocks occasionally make it on the most active list, but volume is still dominated by large-caps. Microsoft averages over 70 million shares in volume per day. Imperial Sugar (IPSU), on the other hand, averages just over 100,000 shares in volume per day. An advance in Microsoft adds some 70 million shares to Net Advancing Volume. An advance in Imperial Sugar adds just 100,000 shares to Net Advancing Volume. It takes a lot of Imperial Sugars to make up for one Microsoft. The same logic is true for the NYSE. ExxonMobil (XOM) averages over 20 million shares volume per day, but Vector Group (VGR) averages around 300,000 shares volume per day. While the Nasdaq AD Line has a downward bias over the longer term, the AD Volume Line does not share this characteristic. Nasdaq listing requirements are not as strict as NYSE listing requirements. As a result, the Nasdaq is full of upstarts in industries ranging from biotech to technology to alternative energy. Even though more Nasdaq stocks are prone to failure, these failures are usually small-caps. The negative impact on the AD Volume Line is minimal because large-caps drive the AD Volume Line. In contrast to small-caps and mid-caps, large-caps are much less likely to go out of business or fail to meet listing requirements on the Nasdaq. There will, however, be a few exceptions along the way (such as WorldCom). This indicator has a good record of forecasting major peaks as indicated by the historical chart below. As always you are looking for divergent action from prices. The current chart for cumulative up down volume follows. Please follow MY CHARTS so I’m not relegated to the dung heap of nobody is interested in this crap. You only have to follow once. Click the blue icon seen in the upper right of each page that says “Follow”. After you’ve clicked once, the blue icon should change to “Unfollow”. Leave it so it says “Unfollow”.